Ecuador’s Foreign Minister Ricardo Patiño revealed at a news conference in Quito that a hidden spy microphone had been uncovered in the office of the Ecuadorian ambassador to London, Ana Alban. Denouncing the find as yet more evidence of the loss of ethics in government relations on an international level, he told the press conference, “We regret to inform that we have found a hidden microphone in the London embassy,” adding that he had received intelligence pointing to the origin of the security breach and would reveal this later on Wednesday. The bug was actually discovered around three weeks ago on June 16, in Alban’s office, during a routine security check ahead of Patiño’s recent visit to London. Patiño said that he would be consulting with President Rafael Correa on the matter and that they would require an explanation from the country responsible. He did clarify that he was not insinuating that this matter had anything to do with the NSA spy network recently revealed by whistleblower Edward Snowden. 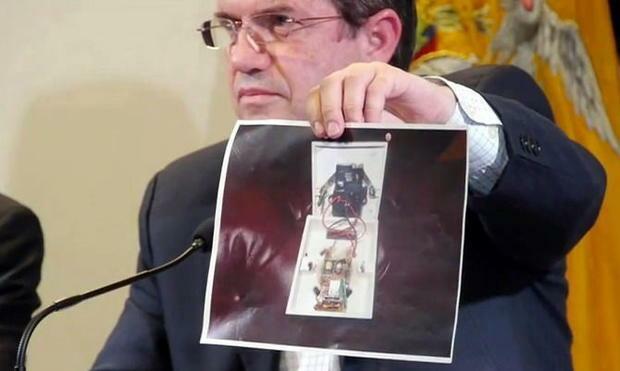 “Furthermore, we first wanted to ascertain with precision what could be the origin of this interception device in the office of our ambassador,” Patiño added. Patiño further said that the device held a SIM card and was designed to transmit private conversations from inside the embassy. Reportedly the British Foreign Office refused to comment on the scandal and a spokesman for Prime Minister David Cameron said he could not speak on security issues. Patiño was careful not to accuse the UK of placing the recording device. However, he did state that Ecuador “is infiltrated from all sides” and according to The Guardian said that It is not illegal for one country to bug another. “The Surveillance Group do not and have never been engaged in any activities of this nature. We have not been contacted by any member of the Ecuadorean government and our first notification about this incident was via the press this morning. This is a wholly untrue assertion. As a side note, Foreign Minister Patiño did add that Ecuador is still considering Edward Snowden’s request for political asylum, despite Vice President Joe Biden previously asking Ecuadorean President Rafael Correa to deny Snowden’s request. However, the problem still remains that Snowden needs to be on Ecuadorian soil in order to legally apply for asylum in that country. Digital Journal reported on another diplomatic crisis that was sparked by an attempt to block a flight by President Evo Morales of Bolivia from entering European airspace, under the suspicion that he was transporting Snowden. Morales was detained at Vienna airport for 14 hours but eventually was allowed into Spanish airspace to refuel in the Canary Islands. “Sieging/bugging of Ecuador’s London embassy and the blockading of Morales jet shows that imperial arrogance is the gift that keeps on giving,” tweeted Wikileaks.